Hummingbird feeders have their specifics that make them somewhat different from the products created for other species. If you’re interested in attracting hummingbirds, you’ll need to buy a specialized product. A bit of research reveals that the market features dozens of hummingbird feeders, some of them better than others. This article will highlight the best product in terms of price to quality ratio and a few runners-up. All of these feeders have gathered numerous positive customer reviews, which is why they’ll all be a great pick. Several characteristics give this hummingbird feeder the number one spot. Aspects HummZinger Excel is designed to hold up to 16 ounces of nectar. Six feeding ports make it possible for multiple birds to enjoy the deliciousness at the same time. The feeder comes with a built-in ant moat that keeps insects from getting to the nectar. It also features raised floral design that protects the nectar from getting diluted when it’s raining. According to buyers, this is one of the easiest to clean hummingbird feeders. It doesn’t come with an inverted bottle design, which makes the entire interior accessible. The inside of the feeder can be washed thoroughly to prevent the growth of bacteria or mold. 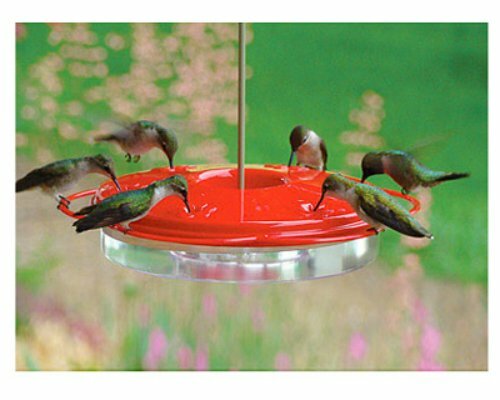 Buyers also like the fact that the feeder is made of UV-resistant polycarbonate. This means it’s not going to fade or crack, remaining in an excellent condition for a long period of time. The saucer-like shape increases the stability of the feeder. Finally, it can be installed using a metal hanger and it’s also post-mountable. First Nature 3090 is a close runner up. This product has gotten almost as many positive characteristics as the Aspects HummZinger Excel. The only difference is the slightly less practical design of First Nture 3090. 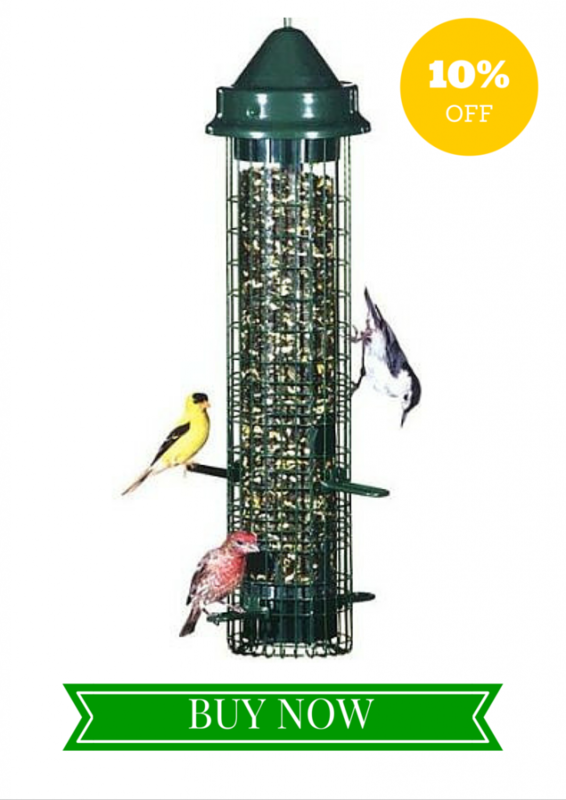 This feeder has a larger capacity of 32 ounces and it features 10 feeding ports. It comes in an attractive red and yellow design that hummingbirds are immediately drawn to. The product is made in theUS from high quality plastics that will not fade or crack. A few additional characteristics include an ant moat, a sealing ring that prevents leaks and a beautiful round perch design. Buyers loved the fact that a sealing ring is available. Many report experiencing leakage problems with other varieties of hummingbird feeders. People that chose First Nature 3090 didn’t have to struggle with such issues. Buyers also loved the fact that the smaller openings of the feeding ports prevent rainwater from entering the container and diluting the nectar. 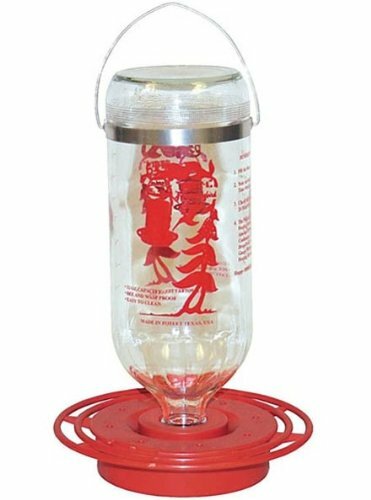 With a design similar to what HummZinger Excel has to offer, Audubon Hummingbird Feeder appeals to the individuals that prefer a saucer-like rather than an inverted bottle product. It has a 12 ounce capacity and six feeding ports. The design features protection against ants and other insects. It’s also great that the feeder is dishwasher-safe for easier cleaning. Several buyers report that the design that’s free from floral ports ensures easier cleaning. Still, the port design is practical enough to prevent rainwater from entering the container. 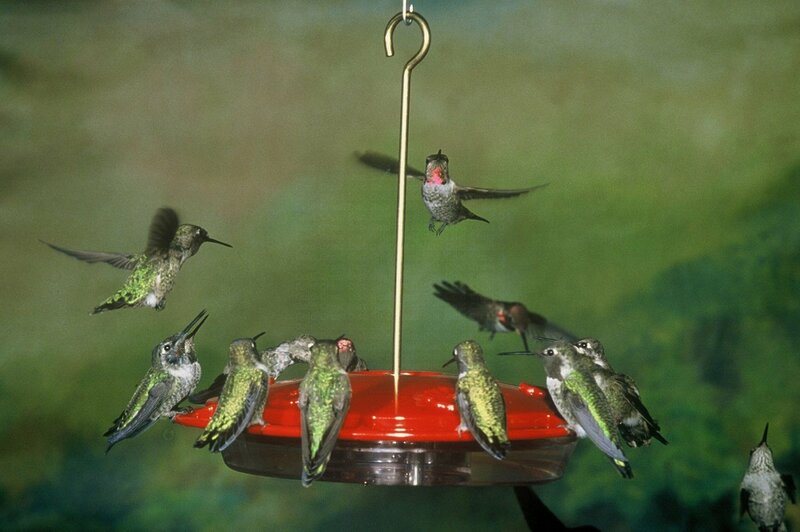 There are a few individuals that have reported using the hummingbird feeder for years. Though after a couple of years in the sunlight the red color did fade a bit, the plastic remained intact. There were no chips or breaks, resulting in an excellent price to quality ratio. The main difference between this feeder and the other varieties is that it features a glass rather than plastic container. 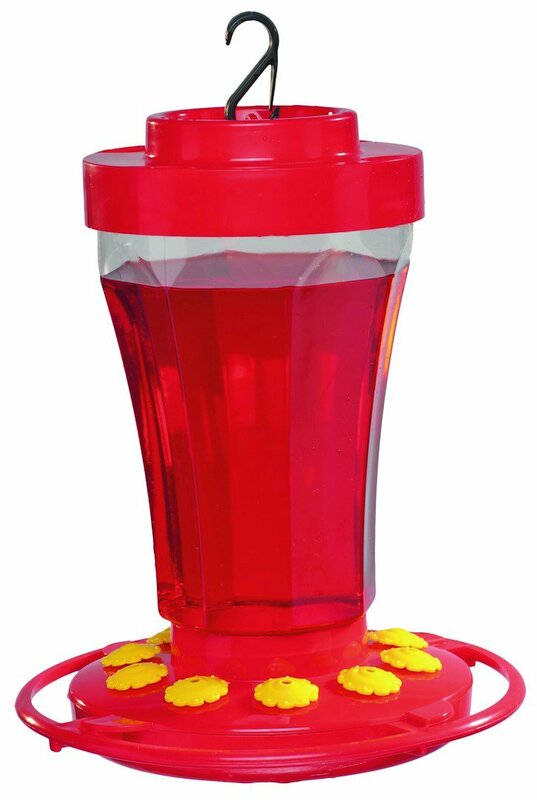 Best-1 hummingbird feeder is a larger product that has a 32-ounce capacity. There are eight feeding ports that attract all hummingbird species to the garden. Best-1’s base is relatively easy to clean – things can get a bit more challenging when it comes to emptying and washing the inverted bottle. This is the main reason why the product is the final entry included in the list. Buyers love several features of this product. For a start, it’s incredibly easy to install and hang. The hanging hardware is tough and durable, regardless of the environmental conditions. The glass design is safe from discoloration. The base is crafted carefully to keep ants and other insects away from the nectar.